The Lagos chapter of the #BringBackOurGirls group has lambasted Dino Melaye for his threat to “beat up” his colleague, Oluremi Tinubu, during a disagreement in a closed-door session held by the senators. 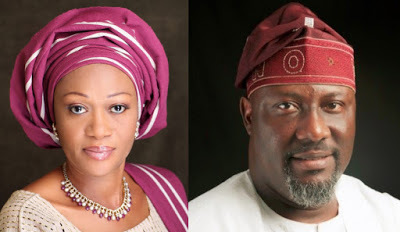 In a statement issued Wednesday and jointly signed by Yemisi Ransome-Kuti, Aisha Oyebode, Ayo Obe, and Habiba Balogun, the group described Mr. Melaye’s actions as “disgusting”. “While the issues of the senate and their disagreements remain strictly their issue, it is pertinent to put an end to this recurring act of threat of violence against women,” the group said in the statement also signed by Yemi Adamolekun, Abiola Akiyode-Afolabi, Ngozi Iwere, Olalere Babasola, and Adwoa Edun. Those who witnessed the Tuesday incident said trouble started when Mr. Melaye (APC, Kogi) urged the Senate to descend heavily on members who had offered to serve as prosecution witnesses in the ongoing forgery case against Senate President, Bukola Saraki, and his deputy, Ike Ekweremadu. Mrs. Tinubu (APC, Lagos) had reportedly criticised Mr. Melaye’s attitude of “always threatening people and behaving childishly and at times like a thug”. The #BringBackOurGirls group said Mr. Melaye’s actions sent the country back to the dark ages, and called on the National Assembly to stop tolerating “misogynists” like Mr. Melaye in their ranks. “With the likes of Senator Dino Melaye in the Nigerian Senate, the Gender and Equal Opportunity Bill which we are campaigning for might never see the light of day,” the group said. “How can we encourage women to take elective positions without fear when the senate, which has only seven (7) female members out of the 109 members, has men like Senator Dino Melaye threatening the few that have dared the odds to get into politics? “How can we put an end to violence against girls and women when those who lead/make these laws are guilty of the same acts? Are there no rules and code of conduct in The Senate? Are there no penalties for irresponsible behavior? The group noted that with the Lagos #BringBackOurGirls group being members of the constituency represented by Mrs. Tinubu, they are calling for an action against Mr. Melaye. “The Nigerian Senate should not aid and abet him this time,” they said.